Sniffling, Sneezing, Stuffy Nose, Watery Eyes…seasonal allergies is a common condition plaguing millions of people every year. Seasonal allergic rhinitis is usually a result of hypersensitivity to airborne particles like pollen and mold. Many people who suffer from the pain, pressure and hassle of seasonal allergies turn to western medicine for relief in the form of antihistamines and allergy shots. These medicines can leave you feeling groggy, sluggish and many still feel discomfort and only slight relief from their symptoms. Acupuncture for allergies offers a natural approach that often helps the person reduce or eliminate the need for medicine. Seasonal allergies are a reaction to the presence of foreign particles in the body by attempting to fight off the “attack” by sending white blood cells, or lymphocytes, to the area. This, in turn, causes the allergy symptoms many of us have grown to dread. In western medicine, we know that lymphocytes are found in the bloodstream and in Peyer’s patches in the spleen, lymph nodes, gastrointestinal tract, and bone marrow. Similarly, in acupuncture, the spleen, stomach, and intestinal meridians are commonly used to increase blood flow, reduce inflammation and restore balance in the body. In a study published in the journal Annals of Internal Medicine, researchers examined 422 people who tested positive for pollen allergies and had allergic nasal symptoms such as a runny nose. The study split the volunteers into 3 groups for 2 months: those who took only antihistamines, those who received acupuncture treatment for allergies, and those who received a “fake” acupuncture treatment placing needles at random, meaningless places on the body. At the end of the study, the group that received true acupuncture treatment for allergies reported greater relief from symptoms than the other 2 groups. Both acupuncture groups reported relief from their symptoms. Acupuncture is a modality of traditional Chinese medicine. It involves inserting needles just into the skin at exact points on the body, which are supposed to restore the balance of your vital flows through the body’s meridians. Many patients feel their sinuses drain and/or their headaches diminish during their first visit while lying on the treatment table. After an initial series of treatments, sometimes twice per week, patients come in for further treatments on an as-needed basis. When treating allergies naturally with acupuncture, most patients continue with the standard treatments they are currently undergoing. However, with acupuncture, many people can significantly reduce or eliminate their dependence on allergy medications. 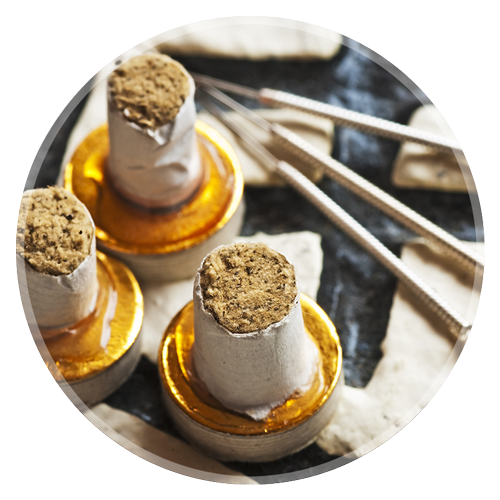 At Louisville Acupuncture, we often use Moxibustion treatment for allergies to stimulate the production and function of white blood cells, which boost the immune system and help fight off infection. We work with you to explain several natural & effective methods of treatment to relieve your allergy pain and suffering such as with Neti Pot or Essential Oil steam inhalation with eucalyptus, peppermint or rosemary. As in many cases, it is helpful to consider a holistic approach to treatment. Diet is often overlooked when it comes to allergies, but when you combine better eating habits with acupuncture treatment you will likely improve your results. Chinese medicine sees sweets as harmful to the spleen function. Consuming sweets are often considered a major factor in the persistence and intensity of seasonal allergy symptoms. Avoiding milk, sugar and other sweets in your diet will help you achieve better, longer lasting results. The ancient Chinese physicians did not fully understand the complete etiology of disease but noticed the correlation between illness and dietary habits. Dairy foods were identified as causing increased phlegm production in the body. Phlegm is associated with sinus congestion, sneezing and headaches. This manifests as bronchitis or asthma. Dairy is also cold in nature so its damaging to digestive fire, particularly if consumed after meals. At Louisville Acupuncture we offer a full range of services with a wealth of benefits to treat your seasonal allergies. Our supportive, professional staff are trained in various traditional Chinese medicine modalities such as Moxibustion, Herbal Therapy, Cupping and Dietary Counseling in addition to acupuncture treatment. We also offer Ayurvedic Wellness counseling, a holistic nutrition therapy that is designed to heal the entire body on a deep level using herbs, food, yoga, and healthy daily regimens to support wellness from the inside out. If you are suffering from seasonal allergies, and are interested in acupuncture treatment to relieve your allergy symptoms, please contact us or stop by. We’re happy to answer your questions and look forward to helping you find relief.